It is National Vodka Day! Each year it is celebrated on October 4th. I had to join in the celebration since vodka is my choice when it comes to liquor. Give me a vodka martini with a dash of vermouth and three great big olives and I am happy. On certain occasions, I will venture into vodka cocktails. Since fall and apple season are here, a skulled cider is in order. The Skulled Cider is great for Halloween too. Why? Because it is made with Crystal Head Vodka. Can you see a big crystal head bottle of vodka on your bar at your party? So cool. Then when you finish the vodka you can fill it back up with red colored water. Oooohhhh! How fun and so festive. The spooky fun is around the corner. I haven’t figured out a costume for this year. The only thing I know for sure is how much I look forward to the trick or treat candy. I’m a big kid about it. I get excited when I see it in the stores. Give me chocolate and all the varieties of it, please and thank you. It is a good thing most of it is given out to the kids. And to sip on a nice beverage while handing out the candy is fun too. What is your favorite vodka drink? Or do you have different ones depending on your mood or the occasion? The great thing about vodka is how well it goes in so many different beverages, sweet or dry. What a fabulous base for a drink. So here’s to vodka today…cheers! 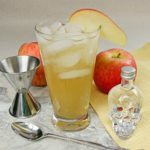 A recipe for an apple cider drink made with Crystal Head vodka, vanilla liqueur, and ginger ale - a great alcoholic beverage for fall and Halloween celebrations. Add all ingredients to a highball glass filled with ice in the order given. Give a quick stir and add the garnish. Garnish: An apple slice on the rim or inside the glass. Recipe ©Copyright Crystal Head Vodka. Used with permission by The Baddish Group. I’m a cherry vodka sour girl! Or a bloody mary girl. Either way, I’m happy. Cherry vodka sour? I’m intrigued and must check it out. I love cherry and that sounds like it could be quite a tasty beverage. I love that Skull Vodka! I am fortunate to have a wonderful husband that bought me a large one. I still use it at Halloween…the vodka is long gone! Happy Vodka Day! I’ll drink to that;) Your cocktail looks delicious. I just love anything with apple cider. Happy Vodka Day! I’ll drink to a classic Vodka Martini – my favorite! My favorite is a Melonball….yum!Cheers – Happy Vodka Day! This is perfect for the fall and winter holidays fast approaching. Thank you for sharing such a lovely recipe and post. I’m thirsty now. I like vodka with freshly squeezed grapefruit juice but this cider might become my new favorite! I hope you have a wonderful weekend! I can’t wait to try this recipe! That is one fancy bottle of vodka. Pinned! I love vodka cocktails, too! Definitely my liquor of choice. And this cocktail sounds fab – love the skull bottle! Ignore my link for comment love, there is a problem…..and kinda creepy for me actually! I have no idea why that link comes up…..